This publication confers the right to object to the application in accordance with Article 7 of Council Regulation (EC) No 510/2006 (1). Statements of objection must reach the Commission within six months of the date of this publication. The ‘Carciofo Spinoso di Sardegna’ is obtained from the local ‘Spinoso Sardo’ ecotype which belongs to the Cynara scolymus botanical species and is characterised by the following morphological particularities: a medium-size, perennial, rhizomatous plant, with the insertion point of the main head located at a height of between 45 and 70 cm; it is assurgent, highly suitable for pollen production, with staggered production. The green-coloured, prickly leaves are of medium size and highly varied in shape, as illustrated by the existence of numerous single blade leaves and other lobed and, more frequently, pinnatisect leaves. The heads form a prolonged cone shape, moderately compact, and of a minimum length of 6 cm and a diameter of between 6 and 13 cm; large, long green external bracts with extensive purple-brown shading, with pointed summits ending in a yellow thorn; straw yellow internal bracts with purple veins; stalks of a length of between 10 and 40 cm (an exception allowed for by Regulation (EC) No 1466/2003) and of a thickness of between 1 and 3,5 cm. Physical characteristics: shape: prolonged, conical, moderately compact head; colour: green with extensive purple-brown shading; yellow-coloured thorns on bracts; stem structure: tender and edible inside, not very fibrous; edible part: no less than 30 % of the weight of the fresh head. Chemical characteristics: carbohydrate content no less than 2,5 g of 100 g of fresh matter; polyphenols content no less than 50 mg of 100 g of fresh matter; sodium: no greater than 0,125 g of 100 g of fresh matter; iron: no greater than 0,80 mg of 100 g of fresh matter. Organoleptic properties: aroma: intense thistly and floral; texture: bracts that are fleshy yet tender and crispy at the base; flavour: full-bodied with a balanced blend of bitter and sweet notes thanks to the presence of polyphenol derivatives and cynarin; astringency: the presence of tannins, which are natural components of artichokes, is hardly noticeable, since it is offset by the prevalent sweet flavours resulting from the significant carbohydrate content. The traditional manner of eating the stems as well as the heads of ‘Carciofo Spinoso di Sardegna’ uncooked allows for better absorption of the nutritional properties it contains. Only ‘Carciofo Spinoso di Sardegna’ belonging to the ‘Extra’ and ‘I’ marketing classes may be granted PDO status. All production steps for the ‘Carciofo Spinoso di Sardegna’ are carried out within the territory indicated under 4. Given their tendency to perish rapidly in terms of a loss of freshness, i.e. of shine and turgidity in the heads, stems and leaves, it is necessary to reduce handling to the minimum and to package them immediately after harvesting, so as to allow for the traditional manner of eating ‘Carciofo Spinoso di Sardegna’ uncooked. This constraint guarantees a definite advantage in terms of freshness by lessening the oxidation and sweating to which the product would be exposed, which would consequently alter its physical, organoleptic and chemical characteristics. The ‘Carciofo Spinoso di Sardegna’ is released for consumption in the following types of closed packaging to which the logo is affixed: trays containing between two and 12 whole and/or cut heads; 500 g to 5 kg baskets in materials for foodstuffs; wooden, cardboard or plastic crates for foodstuffs containing from four to 60 heads. Materials considered appropriate for the packaging of the product according to Community rules on the subject may continue to be used. Each pack must contain ‘Carciofo Spinoso di Sardegna’ of the same market class. The visible part of the contents of the package must, moreover, be representative of the entire contents. 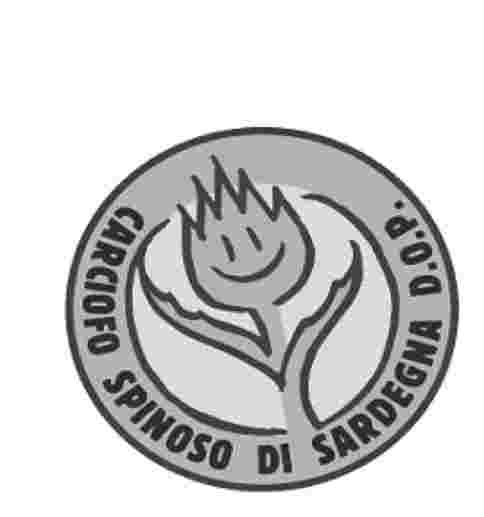 Labels affixed to packaging must bear the ‘Carciofo Spinoso di Sardegna’ PDO designation and the Community logo; the indication of class ‘Extra’ or ‘I’; size; the number of heads contained; all other indications laid down by law; and the logo. The logo for the designation consists of a stylised representation of an anthropomorphic spiny artichoke (‘carciofo spinoso’), with the head of the vegetable becoming a proper head thanks to drawing of a smile and leaves that are transformed into open arms, stretched out in a friendly and welcoming gesture. The message conveyed is that of a sweet-tasting product, despite its prickly appearance. The PDO must appear on the label in clear, indelible lettering of a colour that strongly contrasts with that of the label itself and in such a way that it can be clearly distinguished from the other information which may be printed in lettering half the size of that used for the PDO. It is forbidden to add to the Protected Designation of Origin any description that is not expressly provided for, though business and brand names may be used, on condition that they have no laudatory purport and are not such as to mislead the purchaser. Olbia-Tempo Province: Badesi, Budoni and San Teodoro. The production area indicated above is the one in which the ‘Carciofo Spinoso di Sardegna’ has traditionally been grown. In these municipalities there are, at the same time, all the right soil and climatic characteristics for cultivation and an extensive heritage of experience, traditions and technical growing skills which has been built up and guarantees the product's characteristics. All of the soils within the production area identified in 4, where the ‘Carciofo Spinoso di Sardegna’ is grown, are of alluvial origin; they are fresh, rich in phosperous, iron, magnesium, calcium, potassium and organic matter and tend to be pH neutral or slightly sub-alkaline. The average winter temperature is 11,3 °C, while the summer average is 24 °C. Frost is very rare and snow exceptional. Rainfall is spread irregularly over the year, with a peak during the winter and an almost complete lack of rain over the summer. The particular characteristics of the ‘Carciofo Spinoso di Sardegna’ are its limited astringency, its pleasant flavour, resulting from the balanced blend of bitter and sweet notes, and the tenderness of its flesh encouraging its consumption uncooked. Other characteristics include the high level of polyphenols and other nutrients it contains and the particularly limited levels of sodium and iron. Finally, but definitely no less importantly, the particular constitution of the head, which contains bracts which are tightly stuck to one another, prevents external, harmful substances from penetrating it, thereby ensuring the product's wholesomeness. The characteristics justifying the application for the recognition of ‘Carciofo Spinoso di Sardegna’ as a PDO and which differentiate it from other products of the same product type are: its limited astringency, pleasant flavour, resulting from the balanced blend of bitter and sweet notes, the tenderness of its flesh encouraging its consumption uncooked, high content of nutrients of significance in cleansing the organism (stimulating diuresis, removing toxins from the liver and lowering cholesterol levels in the blood), significant carbohydrate content, coupled with mineral salts, iron, potassium, phosphorous and various types of vitamins, especially A group vitamins. These particularities derive from the strong link to the island territory, which is particularly suitable both because of traditional growing techniques and the favourable climatic, soil and morphological conditions. The significant quantity of calcium, magnesium and potassium present in the vast majority of fields in which the artichoke is grown is the principal reason for the plant's characteristic resistance to stress consequent upon high temperatures and low relative humidity. In the same way, the ‘fresh’, deep soil of these fields, of largely alluvial origin and which does not become waterlogged, provides an optimum exchange medium, guaranteeing the complete take-up by the plants of the phosphorous, iron, potassium and other mineral salts responsible for the characteristics described under 5.2. Climatic factors influence the quality of the ‘Carciofo Spinoso di Sardegna’, inasmuch as they determine the general functions of the plant such as photosynthesis and the absorption of water and nutrients. Sunlight is a very important climatic factor in determining the qualitative characteristics of the ‘Carciofo Spinoso di Sardegna’, particularly the intensity of the sun's rays which, even in the winter months, influences the production of the plant's reserves, such as carbohydrates, which govern its taste, making the artichoke particularly well suited to being eaten uncooked. It should, moreover, be noted that the intensity of sunlight is the same throughout the production area, since the differences in latitude between the areas concerned in the North and the South have no influence on the correct development of the plant. In addition to the intrinsic suitability of the territory, the human resources of the area, with their traditions, experience and skills, allow for the selection of the best artichokes through manual harvesting, sorting and sizing. The cutting down of stems and the pinching out of superfluous shoots carried out by highly specialised local workers facilitate the harvesting of a choice product. The optimal combination of agronomic factors, such as the time of planting, the density of cultivation, the intelligent use of irrigation, fertiliser and plant protection products, as well as the limited one to three-year lifespan of the artichoke plant, with the consequent robustness of the plant, accentuate the natural predisposition of the ‘Carciofo Spinoso di Sardegna’ to be eaten uncooked. From a historical standpoint, the origins of the production, cultivation and, more particularly, the link to the local environment of the artichoke lay in the Phoenician period and the activity has come down the centuries to the present day, when it represents a crucial component of the island's and the country's agriculture. Written evidence of the presence of artichokes in Sardinia can be found from the second half of the 18th century in the treatise ‘Agricoltura di Sardegna’ by Andrea Manca dell’Arca, a noble from Sassari, published in 1780, with one section entitled: ‘Cardoons and Artichokes. Spread. Varieties. Cultivation. Uses.’ The existence of the ‘Carciofo Spinoso di Sardegna’ in the first few decades of the last century is also attested to in the work of Max Leopold Wagner in ‘Das ländliche Leben Sardiniens im Spiegel der Sprache’ published in Heidelberg, Germany, in 1921. In the early decades of the 20th century, a substantial modernisation of the island's agriculture took place, which also concerned artichoke production, with the move away from supplying the local market towards specialised production aimed at the Italian and international markets. It was in this period of major changes in trade that the ‘Carciofo Spinoso di Sardegna’ made its name and on the markets of the mainland the artichoke was most definitely not marketed indistinctly or anonymously; its Sardinian provenance has represented a guarantee of quality and of origin since the early years of the 20th century, one which is appreciated and sought out by consumers, as is apparent from numerous sources. The historical origin of the product has prompted consumers over time to identify the ‘Carciofo Spinoso di Sardegna’ with the image of Sardinia itself, to the extent that it has entered into common parlance and ‘Carciofo Spinoso di Sardegna’ can be found on the menus of various restaurants, on product labels and in commercial documents; this is why the need has arisen to place formal rules on the use of the designation, in order to make the link between the product's characteristics and the territory of Sardinia inseparable and to protect consumers and producers from any incorrect and undue use of the name. The Ministry has launched the national objection procedure with the publication of the proposal for recognising the ‘Carciofo Spinoso di Sardegna’ as a protected designation of origin in the Official Gazette of the Italian Republic No 25 of 30 January 2008.
by going directly to the home page of the Ministry (http://www.politicheagricole.it) and clicking on ‘Prodotti di Qualità’ (on the left of the screen) and then on ‘Disciplinari di Produzione all’esame dell’UE [regolamento (CE) n. 510/2006]’.